We each need some sort of creative outlet, even if it isn’t as obvious or prominent for some. Some people need creativity on a constant basis, while others need it in their lives on a smaller scale. 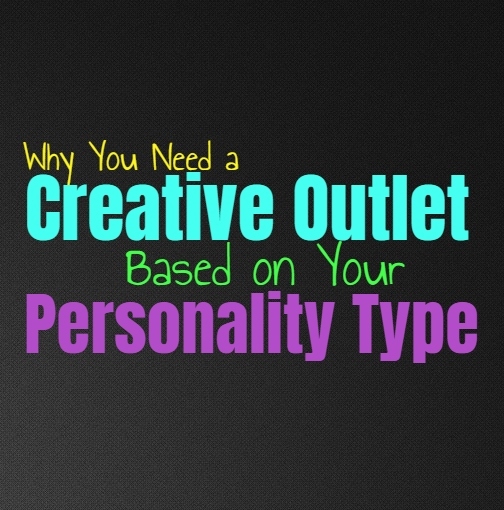 Here is why you need a creative outlet, based on your personality type. INFJs need a creative outlet in order to really recharge and utilize their imagination. INFJs have so much going on inside of their minds and so it becomes challenging for them to keep this all in constantly. They need to explore some of these thoughts in a more creative way, and often enjoy being able to share this with someone special. For the INFJ creative outlets are simply ways to explore their passions and really find something they can dive into and use their inner minds on. ENFJs spend a lot of time taking care of others, but this does utilize their creativity rather often. Their minds can become so filled with tending to the needs of everyone around them and so the ENFJ does often need their own private creative outlet. They need ways to show that they are more than just a caretaker and that they have their own passions and skills which can be rather impressive. They enjoy using their sense of creativity as a way to really express themselves and show others what they are capable of. Creativity is vital for the INFP, and having something or some place they can really express themselves is really necessary. Without some sort of creative outlet the INFP feels less like themselves, often feeling very stifled. They need to have a place to really dive into their passions and use their creative and active inner minds. Without a creative outlet the INFP can feel drained and even become a bit disillusioned with the world around them. ENFPs really need some sort of creative outlet in order to express themselves properly. Sometimes they can be filled with so many thoughts and feelings and it can be hard to sincerely express this the way they want to. Having some sort of creative outlet helps them to get these things out and really share them with the world. For them creativity is a natural things, but finding a place to really express it isn’t always easy to find. Having a creative outlet is truly vital for the ENFP, or else they won’t really feel like themselves. ENTJs try to focus on getting things done and working towards building towards their goals, but that doesn’t mean they don’t need some sort of creative outlet. For the ENTJ a creative outlet often helps them be more expressive and understand their own thoughts and feelings better. At the same time ENTJs do use their creativity when it comes to the workplace, in order to really find new ways to become efficient and effective in their job. For the ENTJ these creative outlets help them to feel more confident in themselves and their abilities, even if they don’t realize it. It is the best way for them to express those inner emotions which they have a hard time understanding. INTPs are often seen as logical people, but that does not mean there isn’t far more to them than this. They are also highly imaginative and creative individuals, and so having some sort of a creative outlet is really important for them. Without this outlet for their creative minds the INTP can feel a bit more stifled and disconnected from themselves. They might go long periods of time without really utilizing their more creative and artistic side, but this makes them feel more drained than they might realize. ENTPs are naturally very creative people and so they really need a chance to express this openly. Without some sort of creativity in their lives the ENTP will feel trapped and lose sight of themselves. They might be stuck in a job which lacks true creativity and if they are the ENTP really needs to find this elsewhere. Their minds are always running through so many ideas and imaginative thoughts, and without a way to express or utilize this they will become anxious and easily frustrated. While ISTJs are often seen as very straight-laced and focused people, it doesn’t mean they lack a sense of creativity. For the ISTJ creative outlets are often smaller hobbies, things they need for themselves and no one else. They might enjoy working with their hands or doing something simple which helps them really tap into their creative side. They need this as a way to wind down and distract themselves from their work life and daily tasks. For the ISTJ a creative outlet might not have to be something artistic, but it does help them feel more expressive. For the ESTJ a creative outlet can really help them feel distracted from their constant work lives and daily stress. They do their best to focus on keeping everything balanced and often take a lot of stress onto their shoulders. Without a creative outlet they will likely bury all of their emotions and stress, and this can leave them feeling really drained. Having this outlet can help the ESTJ express themselves without having to feel truly vulnerable about it. Even if they don’t share their creativity with others, just having something is helpful. ISFJs can spend so much time taking care of others and making sure they are happy, that they lose sight of themselves. A creative outlet can help the ISFJ reconnected with their own feelings and desires, without feeling guilty about it. This is often something they need to do alone, without having others constantly looking in on it. Whether it be something artistic, or simply something like decorating, it is a way for the ISFJ to express themselves and have time to recharge. ESFJs can become so focused on tending to the needs of others and fulfilling their duties, that they lose sight of themselves. Having a creative outlet is a way for the ESFJ to reconnect with themselves and their own desires. When they have a chance to express themselves creatively it is how they can really express their feelings and learn more about themselves than people might realize. Creativity is important to the ESFJ, and having a creative outlet helps them feel much less stressed. ISTPs definitely need some sort of creative outlet in order to express themselves. They often bury their feelings and so having some creative way to let things out is truly helpful for them. ISTPs don’t naturally understand their own emotions and creativity can be a useful way for them to really connect with this without really realizing it. For the ISTP a creative outlet is just a natural way to get things out and learn more about themselves. ESTPs can often seem focused on logic and facts, but they are also creative and adventurous people. Having some way to express their creativity does help them feel more connected to their feelings and being able to express themselves. When they feel trapped or stagnant then the ESTP often needs to dive into something new and this is often where their sense of creativity and imagination comes into play. ISFPs are naturally very creative people and without some way to express this they feel rather stagnant. They need to be able to explore their creative side without feeling like someone is trying to hold them back or stifle them. For the ISFP a creative outlet is more than important, it is vital to who they are and their personal needs. Even if this outlet is simply telling stories or coming up with new ideas, it is part of who they are. ESFPs are creative people who enjoy being able to express themselves openly without reservation. They don’t like feeling stifled or like someone is trying to hold them back from expressing themselves. They often require a creative outlet to really feel like themselves and even unwind from the stress of the world around them. ESFPs can express their creativity in many different ways, but this is something which is part of who they are.